Download this Word document template for a version of Reed’s letterhead suitable for email attachments and other electronic uses. The template can be fully customized with your department or office name and contact information. To download, right click or control click on the link above and choose "save linked file as." If you are in need of printed letterhead, please place your order through printing services. Download a Word document template, letter size or tabloid size, for a poster suitable for print. 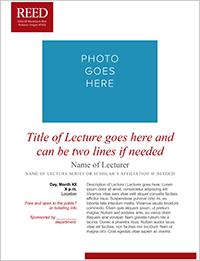 The template can be fully customized with an image; the name, location, and date of your event; your department or office name; and contact information. To download, right click or control click on one of the links above and choose "save linked file as."